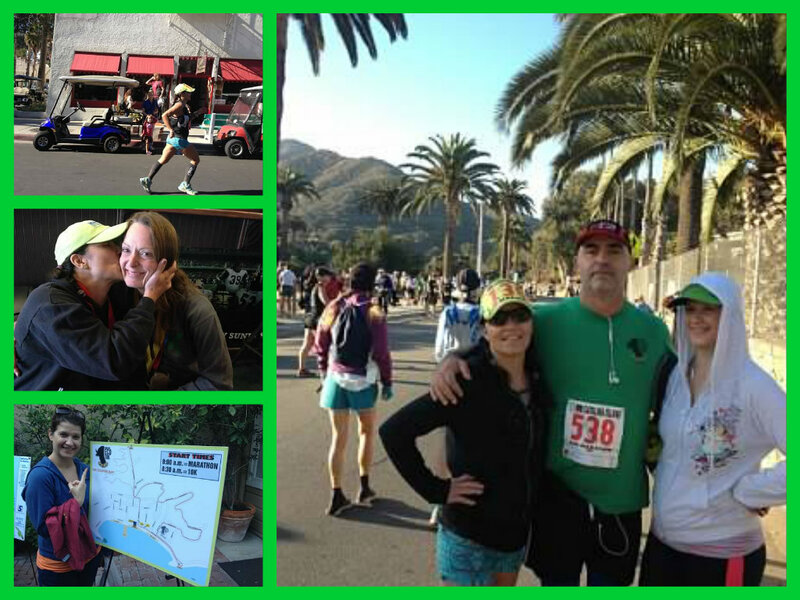 This past weekend my good friend Giovanna ran her 4th Catalina Marathon. Touted as one of the, if not the, hardest Marathons in the US. Yet she still looks forward to the race! She is a little crazy. The good kind of crazy (not to mention super fit, disciplined and healthy)! I’ve had the privilege of being there every time she crossed the finish line. Last year I even ran the 10K. Obviously not as difficult as the marathon but still full of Catalina hills! We do a pretty good job of extending the race trip to cover the entire weekend and always have a ton of fun. In the past the trip was made by her husband, Jack and myself. This year Jack and our friend Tricia, who joined us, ran the 10K (her first race ever which she rocked) and our friend Martha joined in the fun Sat-Sun. Since we consider ourselves experts of the island I thought I’d share with you some of the things we did this weekend in case you care to make the 26 mile boat ride from Long Beach to Avalon! FOOD – Food is the name of the game. In the past we have spent most of our meals at Jack’s and The Lobster Trap. I put The Lobster Trap near the top of the best restaurant list. By the time I get there I’ve eaten so much I’m not that hungry, plus I don’t eat seafood, so I stick with the artichoke and baked potato. I’m told any of the local fish/lobster dishes are delicious. Jack’s is a diner style joint and just what you expect from such a place. This year we were finally able to try The Sandtrap which is a cool little eatery across from the golf course. We had breakfast there a couple of times and it is delicious. Mexican yumminess with a full bar and patio sitting. What’s not to like about that? Additional thumbs up to the Pancake Cottage and Catalina Cantina. Both serve what you would expect from them and both are yummy. 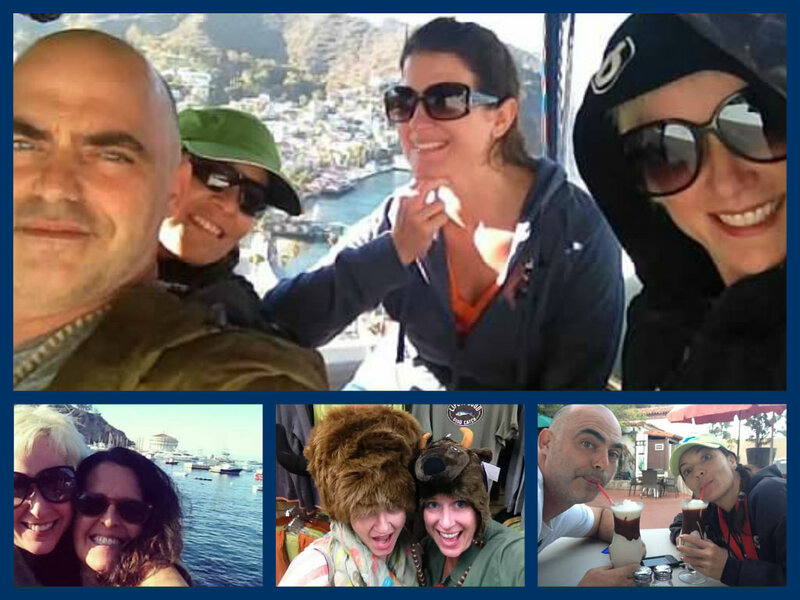 DRINKS – Catalina is for lovers and drinkers … that’s for sure. Everyone serves something to drink so it doesn’t take long to stumble upon a spot to wet your whistle. We spend lots of quality time at JL’s Locker Room. This is mostly due to its location near the race finish line. It’s an easy walk from a table out into the street to see if Giovanna is on her way to the end of the race yet! It’s a bit of a dive bar but I love dive bars so I’m all in. You can bring in food from the burger stand or pizza places next door (the burger place pissed me off saying they weren’t open one morning when they obviously were so don’t go there). We also manage to stop off at the Buffalo Nickel (one of the few joints you need transportation to get to) whenever we stop to get gas. Jack and Giovanna love the Buffalo Milk, the islands cocktail of choice. I’m sure the Buffalo Nickel has good food but we have only had the nachos. They also have a buffalo head mounted at a level that allows you to take pictures with it. A very important prop when drinking with your cell phone camera handy. This year we stopped by Luau Larry’s. “Where the bar meets the bay.” Don’t expect to see any locals here. It has “tourist” written all over it but is a fun teeny tiny joint with some guy singing any song you can think of (really his song book is huge) and drunk people dancing. If you order the Wiki Wacker (drink) you get a free silly hat. As my friend Tricia said “why doesn’t everyone order that.” Of course we did. FUN – Catalina is full of water sporty things to do. 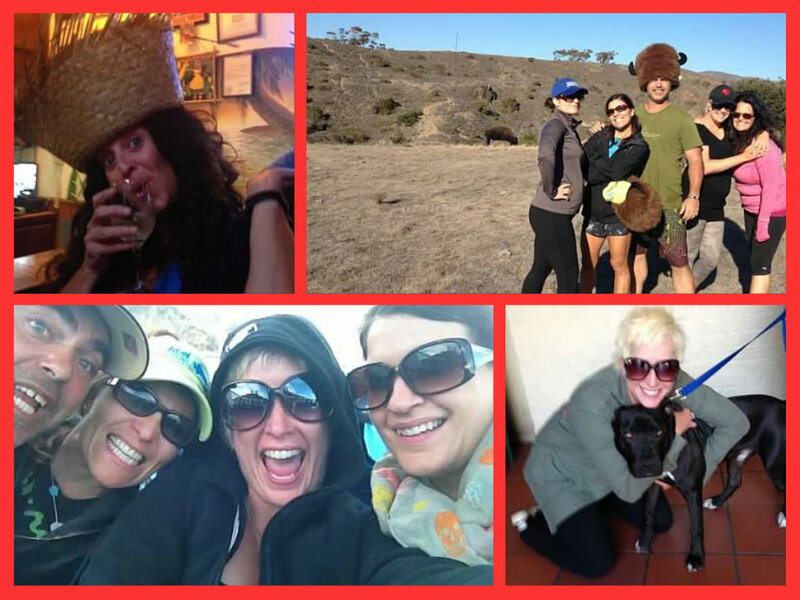 We are often too tired from running and/or drinking to do much but we manage to fit in some non food/drink fun. In the past we have done the Zip Line. It’s a great adventure and I’d recommend it to anyone who visits. Reserve early. It’s the hot activity on the island and fills up fast. This year we skipped the zip line and decided we wanted to go kayaking. Going off a tip of one of Jack’s friends (and Jack’s insistence) we went to Wet Spot Kayaks and Tours for our fix. A small business owned by Chip and his wife Michelle, Wet Spot is the hot ticket. We chose to go on an adventure to Little Harbor on the other side of the island. Chip was about as nice as they come and, having grown up on the island, knew everything and everyone. He drove our group (and only our group — very private) to Little Harbor with lots of stops for history lessons and picture-taking. He grabbed our lunch from the airport when we stopped there then set us up on a little beach that we had all to ourselves. We got to walk around on the rocks, kayak in BEAUTIFUL water, sit down on beach chairs (supplied and put up by Chip) to take in the beauty and eat. Jack and I even took a dip in the ocean. Us gals didn’t bring swimsuits but that wasn’t an issue as Chip had wetsuits for us to wear. We all gave the adventure 5 stars. It was great to see the other side of the island, get away from the crowds, and hang out with such a nice and informative guy! Defiantly see Chip if you get to the island. PLACES TO STAY – We always stay at Hamilton Cove. It is a condo type residence out to the side of Avalon. The locals don’t love it. The architecture, although beautiful, stands out on the island and apparently the developer ran out of money and went back on the promises he gave the town to get permission to build. Even so …. it has the most beautiful views and every balcony faces the ocean with unobstructed views. We stay here because each place also comes with a golf cart. This is the only way to rent a golf cart more than one day at a time. To tell you the truth though the golf cart isn’t really necessary if you are staying in town since everything is walking distance. The golf cart gives you some extra freedom and ability to get to other streets up above the town with incredible views. Since it’s a condo there is also the luxury of a full kitchen which we always take advantage of as well. There you go! 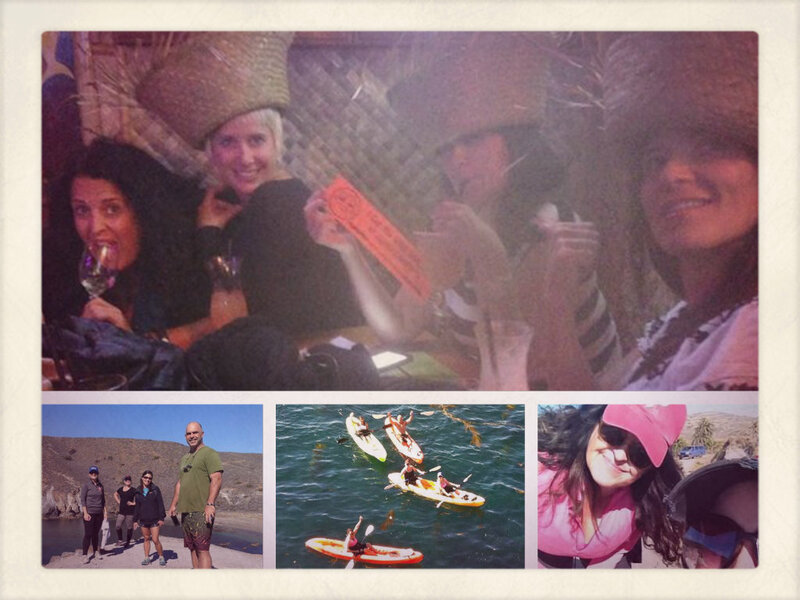 This is how the cool kids do Catalina! You should go. It’s a blast.